Are you ready for Valentine’s Day? Do you have something special planned? 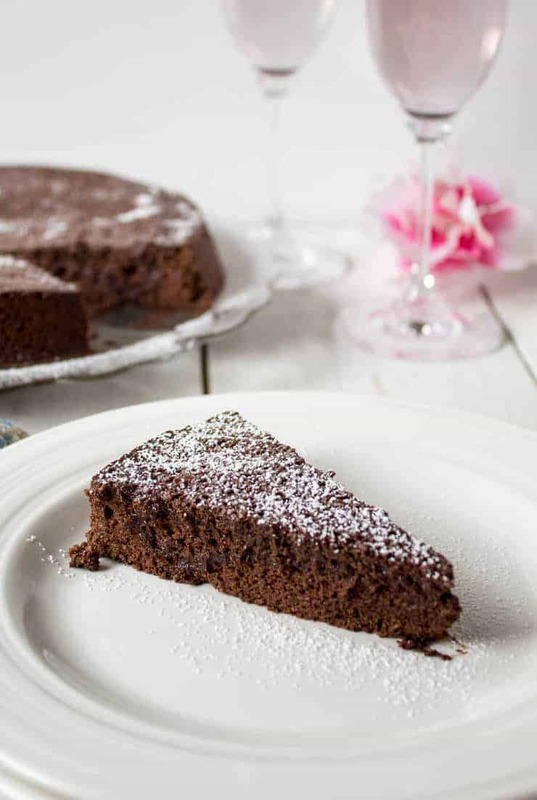 I think you should make a special dinner at home and then make a super special, delicious, flourless chocolate cake! Sometimes we just need to go all out and make a truly decadent dessert. 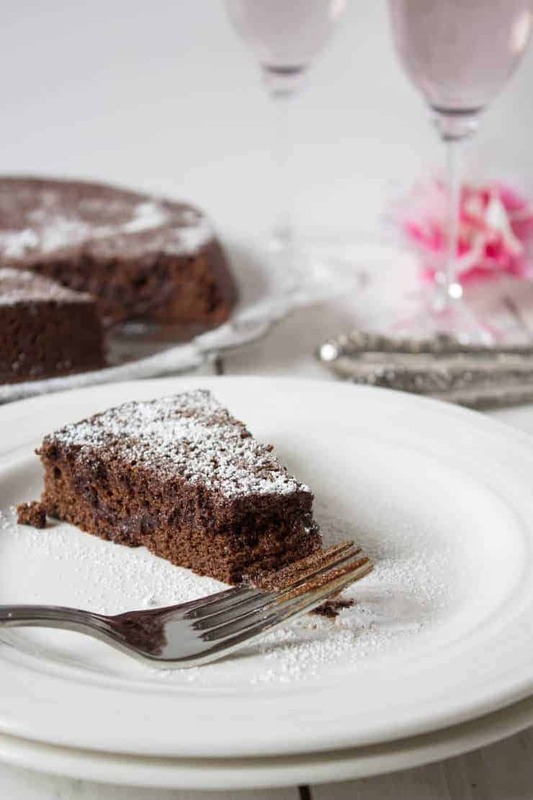 This delicious chocolate cake is just what you need to impress your Valentine! I have also made a Strawberry Swiss Roll Cake, and Chocolate Mousse. All these desserts are very impressive and sometimes it hard to choose which dessert to make. You only need four ingredients to make this cake! How do I decorate a flourless chocolate cake? This cake is beautiful in its simplicity. Serve on a cake plate with a dusting of powdered sugar is all you need for decoration. You could also whip up a some fresh whipped cream and add fresh berries if you like! Other great chocolate recipes include Chocolate Mayonnaise Cupcakes, Chocolate Walnut Tart and Chocolate Chocolate Chip Cookies. Line an 8 inch cake pan with parchment paper on the bottom. Spray sides and paper with nonstick spray. Place chocolate and butter in a large microwave safe bowl. Microwave for 30 seconds at a time. Stir and reheat in microwave until completely melted. Be careful not to burn chocolate. Beat egg whites to a stiff peaks. Mix sugar into chocolate mixture. Using a whisk, whisk in egg yolk to chocolate mixture. Pour cake mixture into prepared cake pan. 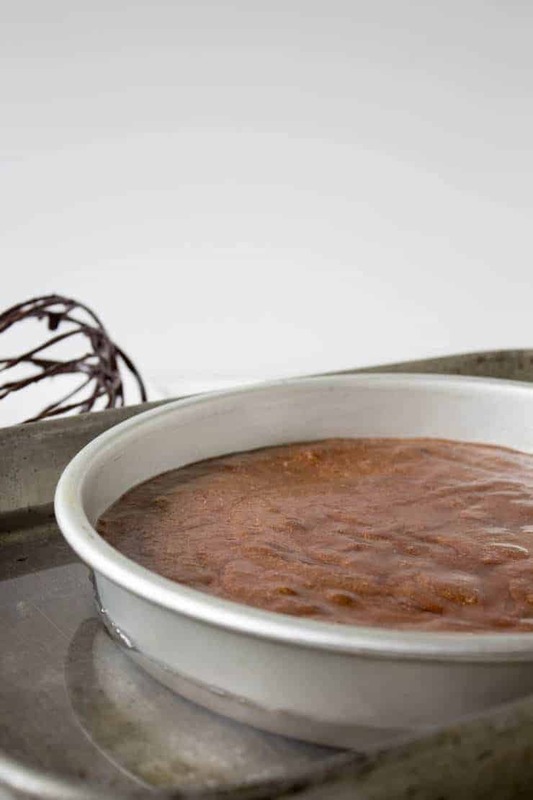 Place cake pan into a large roasting pan. Place in oven. Fill roasting pan with hot tap water. Water level should rise half way up cake pan level. Be careful not to let water drip into batter. Bake at 325 degrees for exactly 30 minutes. Cake will be very moist. Cool in pan on rack for 30 minutes. Run a knife around sides of cake and invert onto a cake plate. Remove parchment. 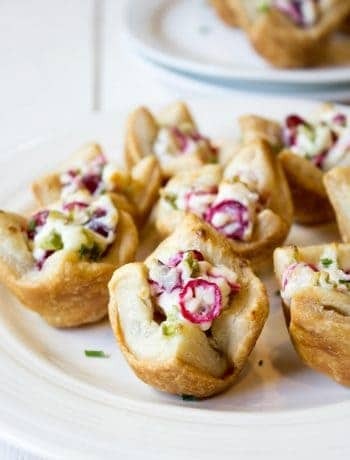 Serve with whipped cream or fresh berries. This looks so decadent! Definitely needing some chocolate right now. Chocolate makes up for the lack of February sunlight, right? I could go for a piece of this cake with a glass of wine right now! Mmm…I always love a simple yet decadent dessert! Can’t wait to try this! It is very decadent! Enjoy!!! Love flourless chocolate cakes, so rich and decadent! And I’m with you on celebrating Valentine’s Day at home with a beautiful dinner and a gorgeous dessert like this one! Love how beautiful this cake has turned out, and also love the fact it is made with only 4 ingredients. WOW! 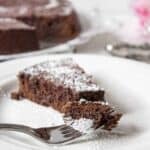 Flourless chocolate cake is one of my favorite desserts! 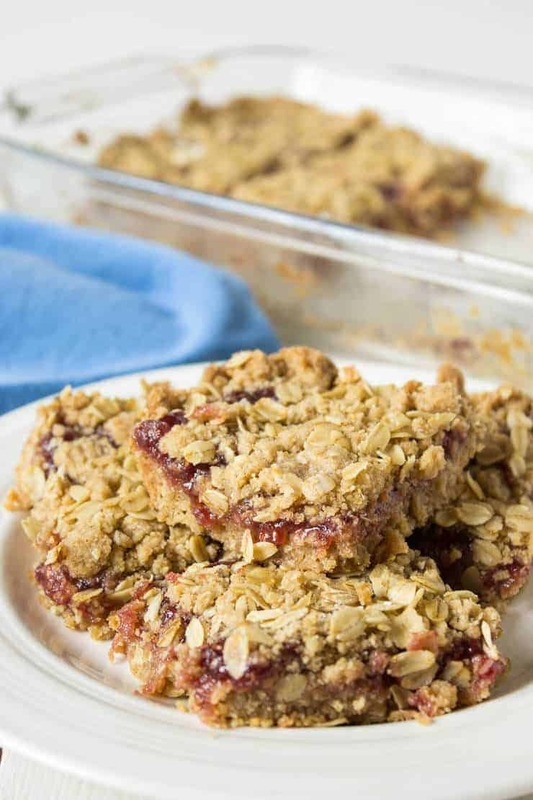 I love how this recipe only has 4 ingredients – simple is best! Your cake looks amazing – so rich and chocolaty! It is very rich and chocolaty! As a chocolate lover, I can’t deny myself a piece of rich flourless chocolate cake. I am with no…no will power at all when it comes to chocolate. I hope the kiddos feel better. You defiantly need this cake as a bit of a pick-me-up! We don’t have anything planned yet, but I agree it should include this cake! 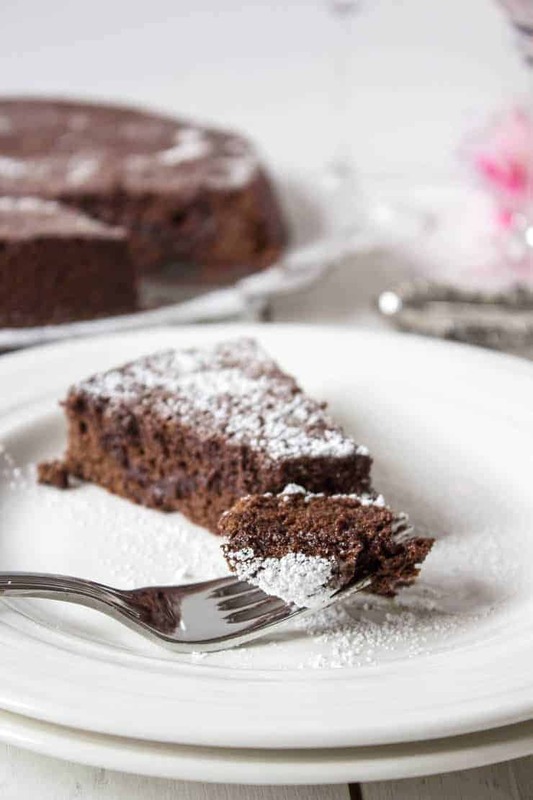 Flourless chocolate cake is such a classic and yours looks perfect, Kathy! I know my husband would probably be fine with eating just this for dinner! Cheers, friend – to a beautiful Valentine’s Day! Your Valentine’s Day could be fairly easy if all you served him was this cake! This looks so good, and definitely rich! ?. When it comes to chocolate desserts, I always think the richer the better. I think this would cure any chocolate cravings! Cures any chocolate cravings, but then I crave just one more slice of flourless chocolate cake! This sounds like it’s right up my alley! Who needs the flour? It just gets in the way of more chocolate! 🙂 Seriously, though, I would love a slice of this cake for dessert tonight! 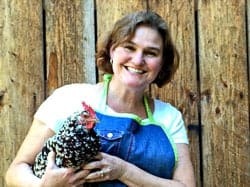 So easy and so few ingredients is a win-win in my book Kathy! Love this! It is a winner for me….so yummy! This looks incredibly easy! I need to make several cakes this week for my daughters birthday parties. Looks like this is making the list!!! She my Valentine’s Day Love, (almost a named her Valentine until husband vetoed that!) But I can still make her this cake. She’s my big chocolate girl. What a great Valentine’s gift…it’s no wonder she loves chocolate! Wish her a Happy Birthday! Wow! 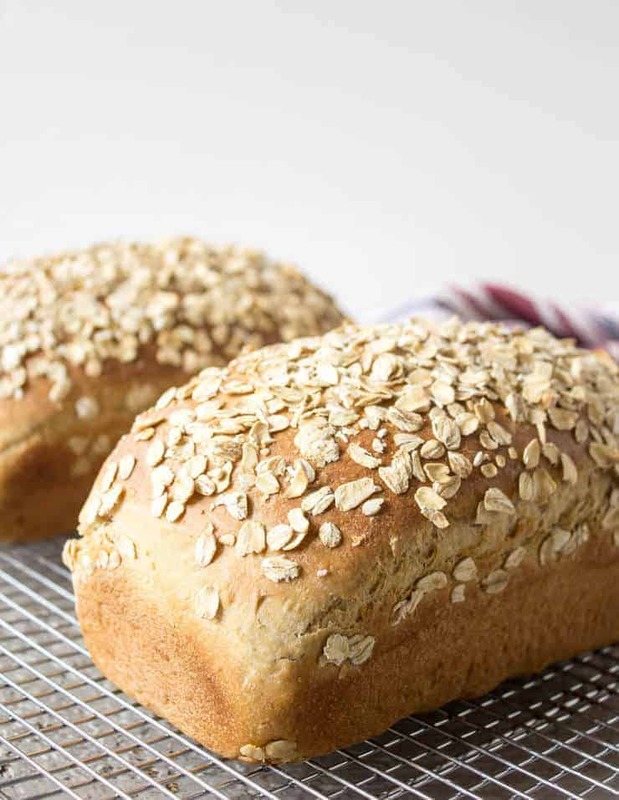 Just four ingredients, so simple and so good looking!